The cannabis resin was found during a search at the airport yesterday. 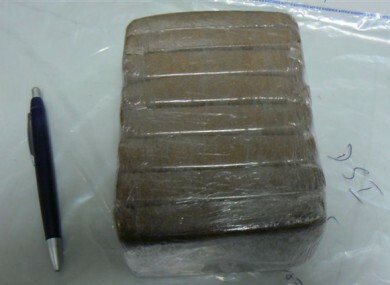 The cannabis resin found in Dublin Airport yesterday. A 27-YEAR-OLD Spanish man has been arrested following the discovery of 1kg of cannabis resin at Dublin Airport yesterday. The Revenue Commissioners say that the man was intercepted at the airport following routine profiling procedures after arriving from Malaga. The drugs were found concealed in the man’s underwear. He is due to appear in court later today. Email “Man arrested in Dublin Airport after drugs discovered in underwear”. Feedback on “Man arrested in Dublin Airport after drugs discovered in underwear”.